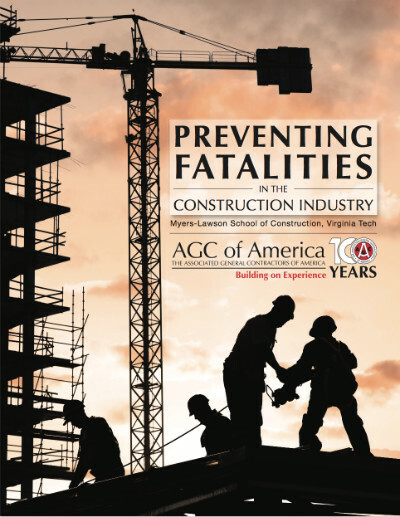 The Associated General Contractors (AGC) of America and the Myers-Lawson School of Construction at Virginia Tech recently released their construction safety study providing detailed insights where the hazards of our industry lie and how we can respond to them. The AGC’s “Preventing Fatalities in the Construction Industry” study analyzed data ranging from 2010 to 2016 to help develop employer-employee safety strategies. Their goal is to bring down the number of workplace-related deaths in construction to zero. 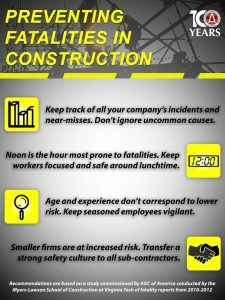 The construction safety study collected data from the U.S. Bureau of Labor Statistics (BLS), including the Survey of Occupational Injuries and Illnesses and the Census of Fatal Occupational Injuries to do a far more thorough review of what’s causing injury and death on the job as well as who’s most affected. What separates the AGC’s study from others is that they use the most recent data available while drilling down beyond top-level categories within the Construction Industry. By delving into our industry beyond the general title of Construction, the AGC could get detailed information based on age, gender, region, and sector. Most injuries occur between 10 am and 3 pm. The fatality rate in small construction establishments with 1-9 employees is a whopping 47%. Hispanics workers now account for 24% of the Construction workforce and only account for 25% of the total number of fatalities. The AGC’s study also reinforced some previously published and understood findings in our Industry. The study found that the number of job-related fatalities increase and decrease with seasonality (peaking during the summer and bottoming out during the winter) and typically between Monday and Thursday. The study also identified Falls as the number one cause of death in construction (33% of all deaths). According to the construction safety study’s findings, employees 35-54 years of age account for 50% of fatalities in the Industry. The AGC’s study reveals that there’s a continued need to for awareness campaigns and reinforcement of long-standing safety programs and practices designed to prevent falls. The study emphasizes the need for communication and the need for ongoing training and awareness programs. As we prepare to participate in May’s National Fall Prevention Stand-Down Week (May 8th-12th) it’s important to keep emphasizing the need for a safety plan and continuous training. The full report is dense read but offers vital information about our Industry and what we can all do to ensure we all make it home at the end of the day.